It's kind of against my religion to bake with cake mixes.... On the other hand, I checked out the ingredients, and there's nothing artificial in the Puppy Cakes, no preservatives, nothing you can't pronounce. 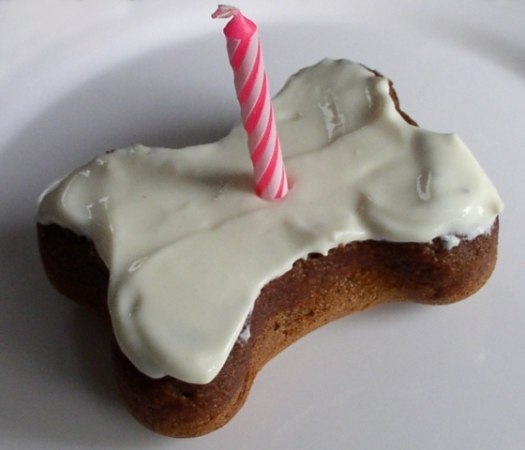 In fact, Buddy's Best Banana Cake and Fifi's Favorite Carob Cake look like they'd be pretty healthy for your dog. The banana and carob cakes have most ingredients in common: whole wheat flour, honey powder for sweetening, baking powder and salt. 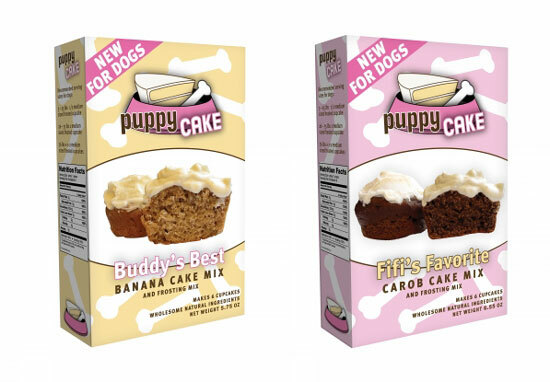 Fifi's Favorite Carob Cake contains carob powder and Buddy's Best Banana Cake has banana powder... so there are no artificial flavors, or coloring. And you add one egg, a little oil, and some water to the boxed ingredients to complete the batter. The cake frosting for both cakes is made from unflavored yogurt powder and requires a little water to make nice and creamy. Even before trying the cakes, I'm sold just on the ingredients. But I have to admit to wanting a taste of this gorgeous-looking cupcake. I wonder if he would share that with me? 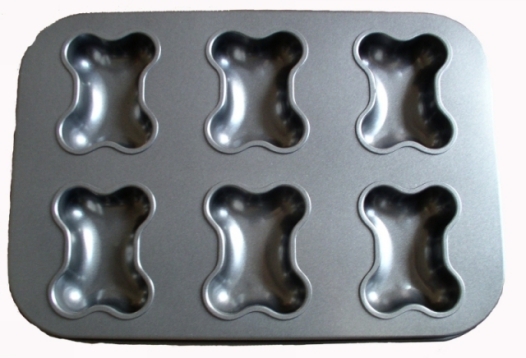 You don't need the bone-shaped cupcake tin to make that groovy cupcake, but if you want one, it so happens that Puppy Cake has it for sale. 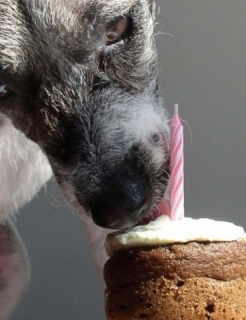 Puppy Cakes are available on Amazon here.